Terroir Wine Services (TWS) creates and coordinates wine events of all kinds for wine lovers and corporate groups, in the U.S. and in France. Whether we are organizing a tasting of prestigious French wines in a luxurious hotel salon for a corporate meeting, or holding a wine tasting dinner for a group of friends who are wine lovers, we make every wine event a memorable and exquisitely executed experience. 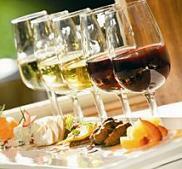 Learn about French wine in a relaxed, fun atmosphere with wine tasting events by TWS. These events are great for groups of all kinds who are looking for a unique, informative and entertaining event: friends or family, organization (church, civic) or corporate (incentive, clients, managers, etc.). Wine events can be held at your home, office or meeting venue, or at a splendid location like a wine cellar, museum, elegant hotel salon, etc. During all wine events, you'll be accompanied by a personable, highly-trained sommelier who will help you learn and answer all your questions. Wine Tastings: for an evening with friends or family, after a business seminar or meeting, for your community group meeting, or to make any event even more special. Choose a themed tasting (prestigious wines, good value wines, wines of a particular region, etc. ), or a combined tasting of wine and cheese, wine and chocolate, wine and foie gras, etc. Wine Tasting Classes: learn how to taste wine and discern its quality so you can better choose the wines you purchase and pair them well with food. You'll learn how to identify aromas and tastes, determine balance and complexity, and pair your wines with your favorite foods. We emphasize using simple language to describe what you're tasting, and we always keep the atmosphere fun and convivial. Wine Tasting Dinners: the best way to learn about food and wine pairing is to taste a number of different wines expertly matched with delicious dishes during a pleasant, elegant dinner with friends or colleagues. Choose a theme if you wish (wines of Bordeaux, all-Champagne dinner, etc.) or let us surprise you! We work with event agencies, notably in the U.S. and UK, to provide wine tasting events for their corporate clients visiting France. In collaboration with highly-trained, local English-speaking wine experts and sommeliers, TWS provides wine tastings, wine tasting dinners and wine classes for corporate meetings, incentives and seminars for some of the world's best-known corporations (Microsoft, Upjohn, London Financial Times, etc.). Please contact us to discuss your needs and to obtain a price quote for your wine event.